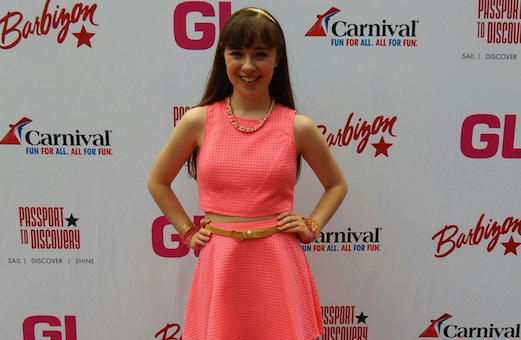 You know Kristina Lachaga as "The Girl With The Big Pink Heart" (and, of course, from the GL stage at our 2015 Fashion Bash event). Read her very special guest post about her day as a GL superstar rocking the mic and cheering in the stands. Hey #GLGirls…and #Directioners…and, of course, #Heartbreakers! Just FYI, August 8th was a TOTAL DREAM DAY and total #goals. 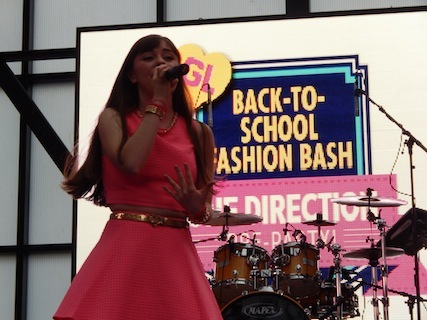 Between performing at #GLFashBash aka the ONE-DIRECTION PRE-PARTY (say what?! ), meeting so many amazing & stellar #Heartbreakers all day long in Baltimore (way too much fun!) and then going to the One Direction concert at M&T Bank Stadium that night (swoon! ), I had the best day ever! I wanted to make sure that even if you had to R.S.V.P. "no" to the party of the summer (sad face! ), you wouldn’t miss the BIGGEST and BEST moments! You heard me right! I’m giving YOU the behind-the-scenes scoop and a first-hand look at some of my fave, mega moments from the big day in my YouTube video “From Fash to Bash: A Day of ‘Style’” later in my article! So…grab some popcorn and all your besties (and 1D lovers! ), read on and then experience the day for yourself when you click play! 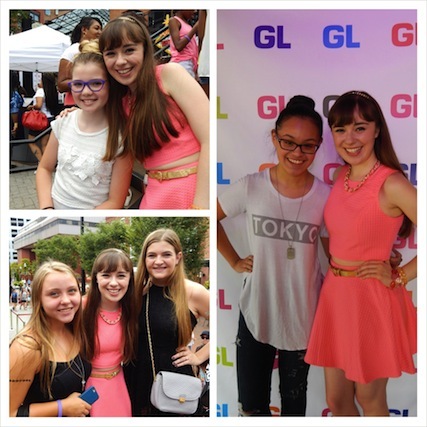 And speaking of meeting people…The GL Meet & Greet zone was so much funnn and I loved meeting every single one of my #Heartbreakers in Baltimore! Y’all are too cool with your funny jokes, fashionable style, & adorbs selfies. ONE #HEARTBREAKER BROUGHT A SELFIE STICK. Life = made! AND I EVEN MET A HARRY STYLES LOOK ALIKE. I'll take it. What more could a girl ask for? MAYBE TO GO THE ONE DIRECTION CONCERT, TOO. BUT IDK. CAUSE THAT WOULD BE AMAZING, TOO (#OTRABaltimore I love you). 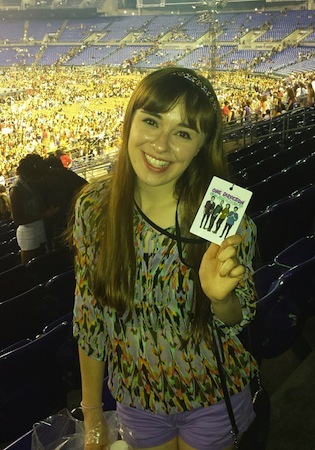 I hadn't been to a One Direction concert since their British/Irish, very Beatle-like Invasion back in 2012. Back when Styles still sported the blazer, Niall didn't yet rock the guitar on-stage, Louis liked girls who liked carrots and wearing shirts with stripes and shoes with no socks, Liam had just let us in on his spoon-phobia and Zayn was still, well...there. So right after #GLFashBash, we loaded out of Power Plant Live!, did a quick change from pretty in pink performance attire to a plethora of paisley and purple and headed over to M&T Bank Stadium for...drum roll please...Honda Civic Tour Presents One Direction: On The Road Again. YAY YAY YAY (times infinity). ONCE WE FINALLY MADE OUR WAY OVER TO THE VENUE, BOUGHT MERCH & FOOD, WALKED AROUND A BIT AND THE LIKE, WE FOUND OUR SEATS. And sat. And waited on the edge of our seats in an energetically-patient way. And did the wave and screamed and listened to music blasting through the speakers and saw familiar, beloved faces on the bigscreen and kept thinking the concert might just start any second now until...LIGHTS OUT. The crowd? Massive. Over-40,000-people-up-on-their-feet-while-screaming-and-singing-every-word kind of massive. The energy? Out of this world high. And One Direction? Did you even have to ask?! They were "Better Than Words" and it was a concert for the record books. Streamers flew through the air. Fireworks lit up the night sky. Purple could be spotted pretty much everywhere (a special ode to the Baltimore Ravens). "Drag Me Down" was the ultimate showstopper. And let's face it: I had no control during "No Control" and I will never get over "What Makes You Beautiful" (guess it's my #MusicCrush). Who knew that 3.5 years ago when I first heard their voices on my friend's iPhone during our Fashion Merchandising class that those boys would turn out to be the world's biggest boyband and basically change pop culture (and the twitter feeds of girls around the world) forever?! #OTRABaltimore was a night to remember and left me wanting more (and just for the record I got my wish: we went to their concert in Philly! #DoubleOMGYes, and BTW can that hashtag be my thing?! Let's get that going!). After the concert was over and I realized that the “I LOVE YOU NIALL” screams of the girl next to me hadn’t in fact been that deafening, we had to wait in the parking lot for 1.5 hours to leave. But it actually wasn’t the end of the world either because we got to watch the crew load out from the back of the stadium – very cool behind-the-scenes moment to watch! I’d say pretty successful day for sure. - We screamed and squeeled for everything and anything: wardrobe carts being pushed up the ramp to the backstage area, people walking from backstage to the audience, a couple of false alarms to the actual start of the concert...but HEY HEY HEY! Concert Insider's Tip from Me to You: Watch the tv screens on the concourse so you don't miss a single moment. You’ll be the go-to girl when everyone's wondering what cued the stadium to erupt in screams. - Directioners heart the 5SOS Fam. Like when the "Good Girls" music video had its moment on the big screen before the concert started, all lips were moving as far as the eye could see. - There were some epic, on-stage moments that didn't involve singing at all and they can be summed up in three words: water fights, lemon and tupperware. (Harry was responsible for a majority of the hilarity that ensued). - The Projects: For each city of the One The Road Again Tour, Directioners created projects to make their city stand out and super memorable for the boys. Baltimore did not disappoint with (at least) 3 different projects, like Burning Up Baltimore (the stadium was lit up with purple glowsticks - how stellar & magical? ), Purple Out (lots and lots of purple, everywhere. I wore purple, too!) and the Bandana Project (fans wore different color bandanas to signify who their fave member is –oh boy, so hard to choose!). - And a universal fact felt by everyone at M&T Bank Stadium...We didn't want the night to end. Like seriously! Couldn't the boys have stayed *literally* "Up All Night" with us in Baltimore?! And now all the North American tour dates are over. UGH. Why can't there ‘Bmore?’ We want more, we want more (now that's a stadium chant for ya if I do say so myself). Bottom line: #GLFashBash & #OTRABaltimore were "Once In A Lifetime" experiences & I can def mark down August 8th on my calendar as totally magical, unforgettable, & jam-packed with AMAZING-NESS. (Say it with me: "Ah-mazing-ness"). And trust me, I know that once Charm City steals your heart, there is no going back. My heart goes in "One Direction," always leading me back Baltimore (aka my first hometown!). Can't wait to see what Girls' Life has in store for next year's Fash Bash...guess we'll just have to wait and see! Until next time, #Heartbreakers! Have you ever been to a One Direction concert? What were YOUR most memorable moments? I wanna know, so drop me a note in the comments like right NOW, #GLGirls, #Directioners, & #Heartbreakers! If you couldn't already tell, pink is my color. I love it so much! So I obviously L-O-V-E-D wearing this pink two-piece outfit that we accessorized with gold and pink jewelry. The funny thing about this outfit was it looked like a different color in (almost) every photo. Oh! And I usually don't wear wedges to perform (I'm a heels/pumps kind of girl), but I couldn't pass up the chance to wear these gold, glitter wedges by Guess. AND GUESS WHAT: They're actually pretty comfy to wear around...until you take them off. Ouch. Had a blast hanging out with the #GLFashBash artists throughout the day – Skylar Stecker, Taylor Felt, Savannah Outen, Spencer Sutherland, and Haley Georgia! 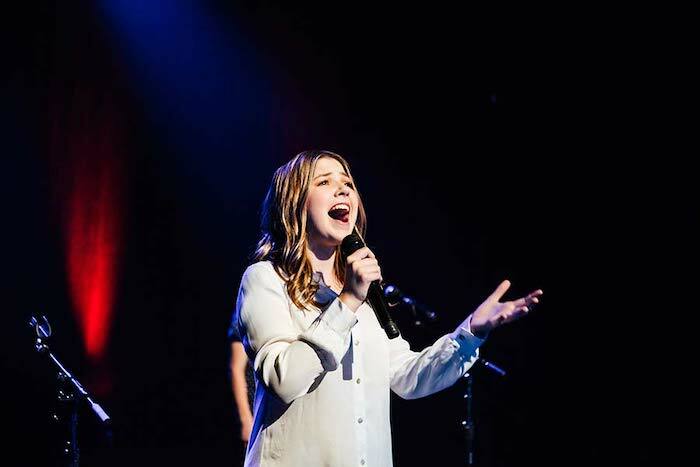 So happy I got to finally reunite with Savannah Outen (I recorded background vocals for her song "No Place Like Here" when she performed in the 2011 Macy’s Thanksgiving Day Parade). YAY! The Adorables. 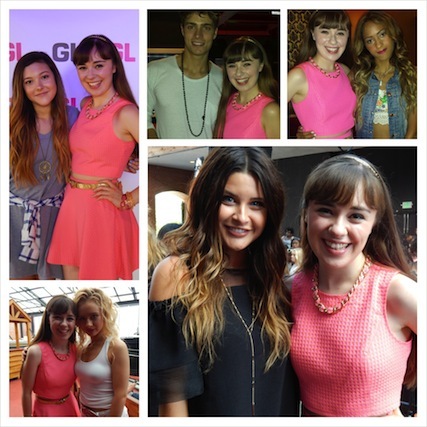 Pretty positive these girls made the rounds of most of the artists' Instagrams (including mine!). And it's no wonder why! They are the epitome of fashion, definitely future pop-star princesses, and the definition of absolute cute-ness. They're ruling the #squadgoals cause they’re just that adorable. #HEARTBREAKERS ARE SO STELLAR AND FAB AND ILYSM. XOXO. 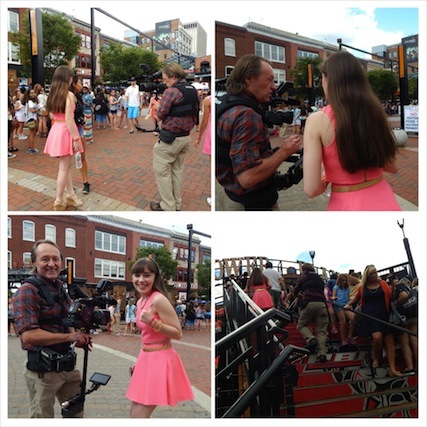 #BigPinkHeart thanks to my videographer Bruce for capturing all the moments of #GLFashBash – and for walking up and down those stairs a bazillion times! Talk about celeb sighting! 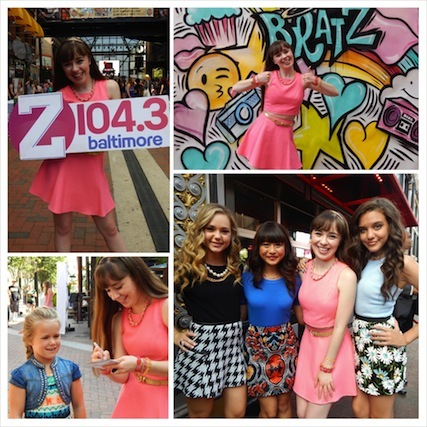 Did you catch the Bella and the Bulldogs girls in the #OTRABaltimore crowd?! Lilimar told me she had an AMAZING time – going to the concert was the perf way to cap off a day of total "Style!" 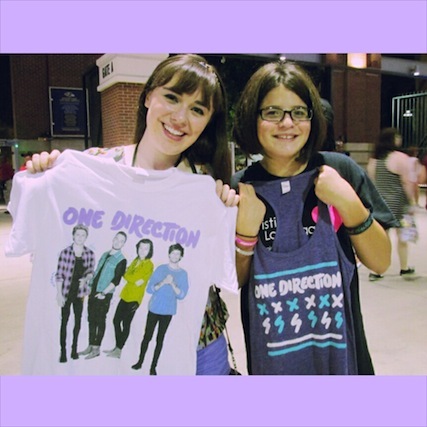 Meet Caitlyn (left) – total Directioner and concert lover! I met her at the rest area at 6:30am the morning after #OTRABaltimore –I totally couldn't miss her in her One Direction Tour shirt (that tee design was the literal fave). And she and I would def get along cause she loves “Illusion” and “Little Black Dress” more than words! 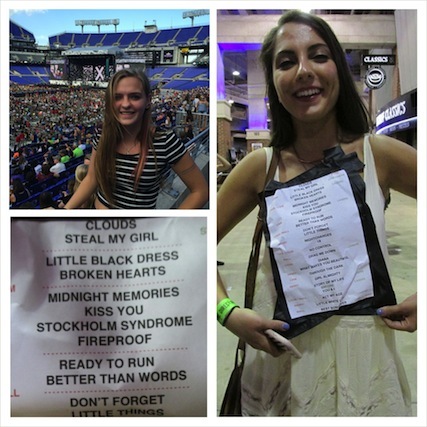 Plus, I met another girl (right) who got to keep One Direction’s set list STRAIGHT OFF THE STAGE. YOU GO GIRL. Samantha and I L-O-V-E our One Direction tees that we picked up at the concert! They’re so cute! From soundcheck to performance time, I had a blast singing my heart out for everyone at #GLFashBash! HOPE YOU HEART “R.S.V.P.” Every moment of the day was absolutely magical! 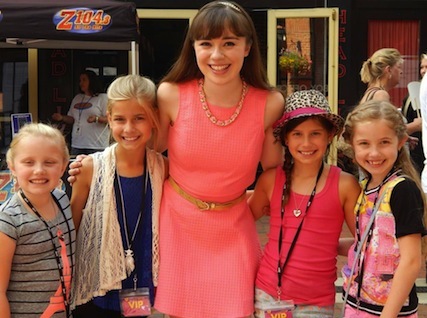 Thanks GL and Z104.3 for the best day! Make sure you check out my recap video on YouTube: “From Fash to Bash: A Day of ‘Style’” so you don’t miss one thing!